English: Bullbird; French: Coracine ombrelle; German: Nacktkehl-Schirmvogel; Spanish: Pájaro Paraguas de Cuello Desnudo. Umbrellabirds have sharp and powerful claws to secure good grips on branches during calling. This group comprises the largest of the cotingas, being about the size of a crow. As is the case with most cotingas, the females are smaller and less dramatic than the males in terms of ornamentation. The males in this group are entirely black, except for a red throat pouch in the male. Additionally, their ornamentation and calls make um-brellabirds among the most unique of the cotingas. The head carries a canopy-like metallic glistening crest along its entire length; this crest projects over the tip of the heavy beak and is reminiscent of an umbrella, providing the name "umbrellabird." In addition, an apron-like feathered wattle hangs down from the breast. The much-widened trachea enables umbrella birds to utter "terrible roaring" sounds which have earned them the name of "bullbirds." 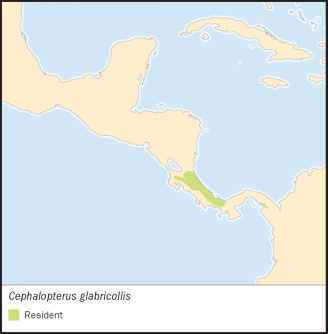 This species is restricted to the Caribbean slope and central highlands of Costa Rica and northeastern Panama. It ranges in the foothills at 330-6,600 ft (100-2,000 m). The bare-necked umbrellabird leaves the breeding grounds in the highlands (2,600-6,600 ft [800-2,000 m]) in late July or August, returning there from the lowlands in March. The sexes are segregated between altitudes to some degree during the nonbreeding season, with males often found at 330-1,600 ft (100-500 m), and females found below 660 ft (200 m). The umbrellabirds consume fruits such as berries and palms. They also eat nuts. Larger seeds of the fruits they consume are regurgitated. This helps regenerate the tropical forests they live in, as seeds of their preferred food plants are dispersed throughout the forests. Insects, larvae and some spiders are taken as well. Animal matter is consumed especially during the rainy season when fruits are more scarce. Nest is built above ground, often in fork of a tree, and constructed very roughly of loose twigs such that the single egg or chick can be seen from underneath. The bare-necked umbrellabird is considered Vulnerable. Global numbers are estimated at fewer than 10,000 individuals for the species, with populations declining. The principal threat is habitat fragmentation. In Costa Rica this is manifested through conversion to banana plantations, cattle ranches and non-sustainable logging. Agrarian conversion is the main factor driving habitat destruction in northeastern Panama. 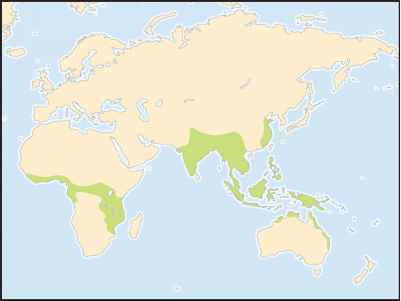 The birds' geographic range is estimated at 4,600-5,800 mi2 (12,000-15,000 km2).